This is Millie, a 1 year old cat who broke the ulnar bone in her elbow. The break was caused by a bullet which shows up as bright white on the picture. We see this surprisingly often. 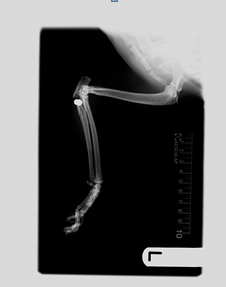 Thankfully an operation to remove the bullet and stabilise Millie’s fracture with pins and wires was successful, and she made an excellent recovery. This is Louis the chinchilla, who broke his arm. After a long and fiddly operation we managed to stabilise the bones in his arms using tiny metal pins usually used as cannulas! The pins go through the bone at different levels, and are then held together outside the skin by a special putty which sets rock hard and holds the pins, and therefore the bone fragments, firmly in place. The only complication we had with Louis was that he constantly gnawed away at the putty, requiring us to repeatedly add more to the frame! 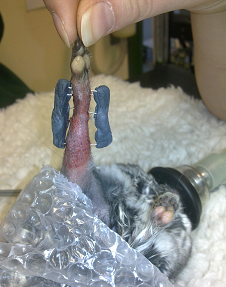 Despite this, he made an excellent recovery and the pins were removed after 6 weeks. This is Roxie, a gorgeous German Shepherd dog that injured her wrist. She needed surgery as she couldn’t bear weight on that leg. We performed the operation here at Kelperland and it was a great success – we screwed a stainless steel bone plate onto the bones around her wrist. This fuses all the bones in the wrist together solid, so Roxie could use the leg again pain free. I’m thrilled to say she has made a full recovery!